The EU has begun legal action against against Poland, Hungary and the Czech Republic for refusing to accept refugees under a 2015 solidarity plan. Migration Commissioner Dimitris Avramopoulos said the three countries had ignored "repeated calls" from the EU's executive to take their share. Only 20,869 of the 160,000 refugees have so far been relocated in the EU. The three states could be referred to the European Court of Justice (ECJ) and eventually face heavy fines. The relocation plan was conceived in response to the large influx of migrants and refugees in 2015, in an attempt to relieve pressure on frontline states, mainly Greece and Italy, where the vast majority of migrants were arriving. EU countries agreed to relocate 160,000 asylum-seekers between them - though Romania, the Czech Republic, Slovakia and Hungary voted against accepting mandatory quotas. 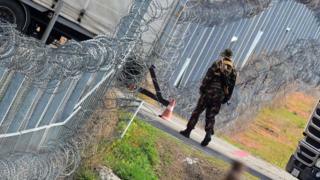 Hungary and Slovakia challenged the quota last month in the ECJ. While the UK and Ireland were exempt from the original 2015 proposal, Poland's previous government backed the plan, although its current Eurosceptic administration has since rejected it. The Czech Republic has accepted only 12 of the 2,000 it had been designated, while Hungary and Poland have received none. "I regret to see that despite our repeated calls to pledge to relocate, the Czech Republic, Hungary, and Poland have not yet taken the necessary action," Mr Avramopoulos, told journalists. "For this reason, the Commission has decided to launch infringement procedures against these three member states. I sincerely hope that these member states can still reconsider their position and contribute fairly." But Poland has already signalled it will not fall into line with the quota. "Each decision to relocate groups of migrants encourages thousands or millions more at the borders of Europe, to come to Europe, to get on boats and pontoons and risk their lives to reach the European continent," said Polish government spokesman Rafal Bochenek. Czech Prime Minister Bohuslav Sobotka stressed that his country too would not take part either, "with regard to the worsened security situation in Europe and dysfunctionality of the quota system". The quotas were based on the size and wealth of each country, but Austria and Denmark have so far not taken in any refugees either. Despite the small number of refugees relocated from Italy and Greece, the European Commission says the pace has quickened since January.